The fact that often strikes one regarding even the largest ships of “The Age of Fighting Sail” is the sheer number of men – and of guns – that they carried. 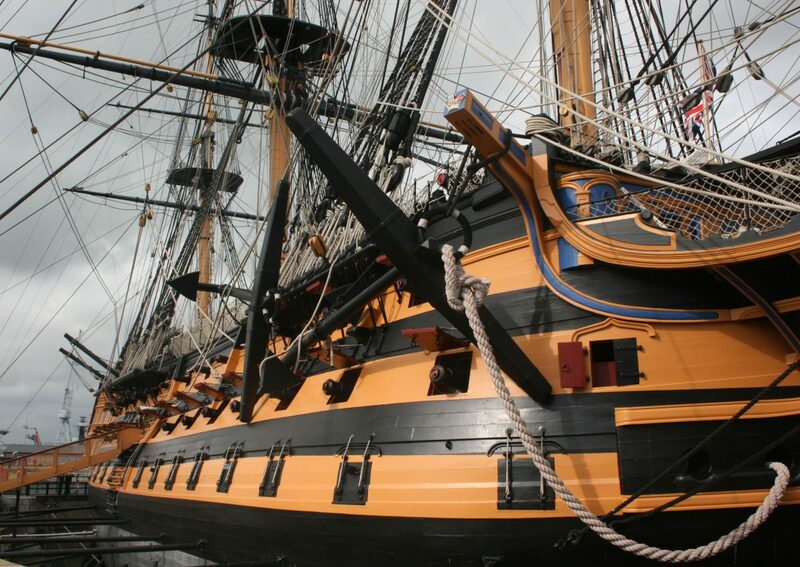 As an example, Nelson’s HMS Victory, which is still extant at Portsmouth in all her glory, carried a crew of 850 plus 104 guns of varying sizes. It is all the more remarkable that all these were carried in a ship 227 feet long overall. (the photographs in this article were taken by myself, Antoine Vanner, prior to the recent refit of Victory). 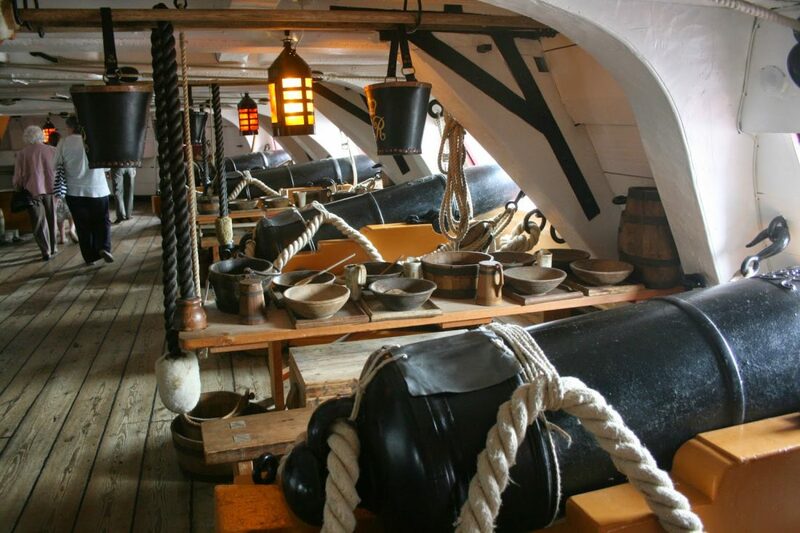 HMS Victory at Portsmouth – 32-pounders mounted on lowest tier. Gun ports closed. The number of guns determined the total number of men carried, since the crew for crew needed for sailing only was considerably fewer. 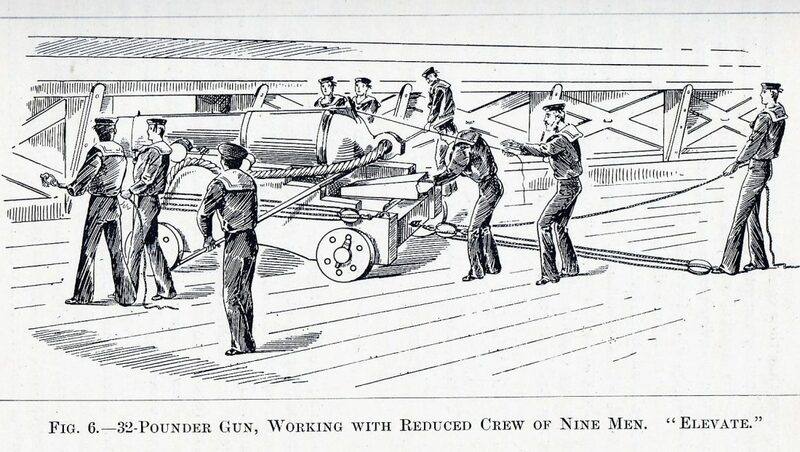 The size of the crew required to serve a single gun was remarkable by modern standards and this was brought home to me by an account in a book entitled “Naval Gunnery”, by Captain H. Garbett R.N., published in 1895. The greater part of the volume deals with the breech-loaders of the 1890s but the first chapter discusses the smooth-bore cannon era in considerable detail. A full account is provided of how a 32-pounder – the largest type of gun carried by Victory and her contemporaries – was served. Due to their size and weight these weapons were carried on the “gundeck”, the lowest tier, 30 of them in total on Victory. The next level up, the middle-gundeck, carried 24-pounders, and above that again the upper-gundeck with 12-pounders. 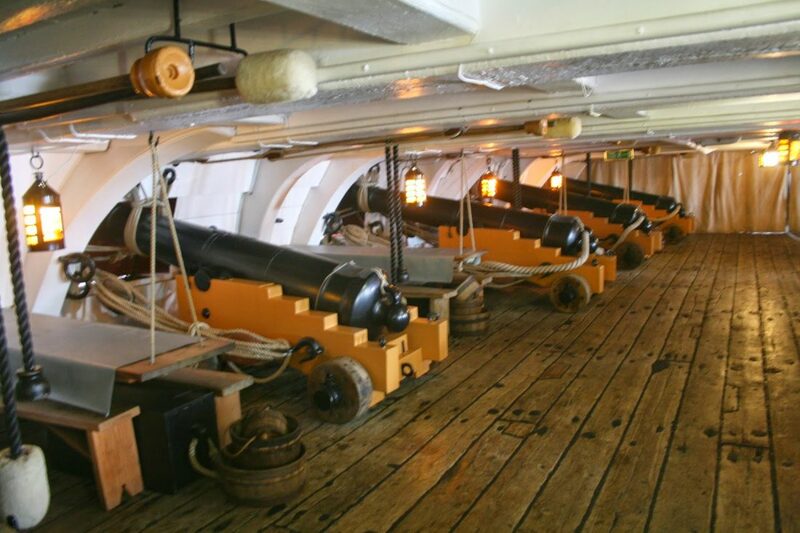 Guns of the latter size were also carried in the open on the quarterdeck and forecastle, where the close-range, large calibre Carronades were also mounted. and slung their hammocks over them. Note the fleece sponge at end of heavy rope. 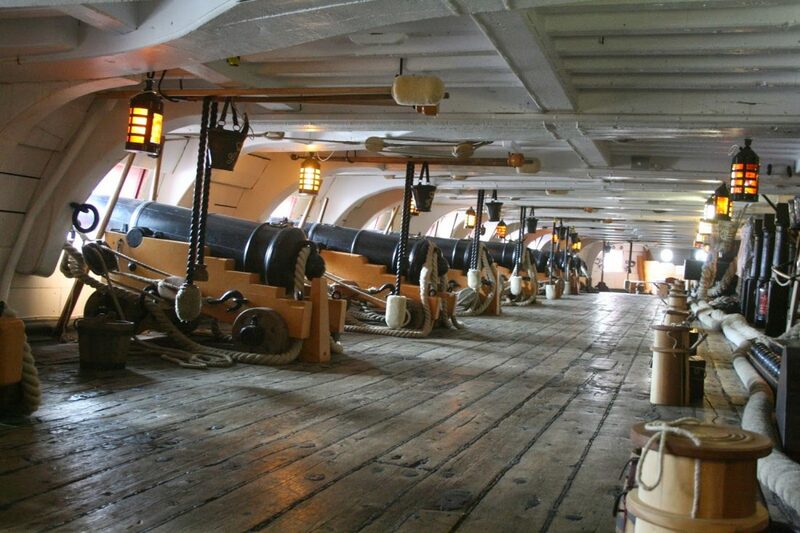 The ship carried only enough men to crew the guns on one side of the ship only and should it be necessary to fight on both sides simultaneously – as when breaking the French line at Trafalgar – the guns could only be served with half-crews. The weapons were heavy – a 32-pounder’s barrel alone weighed almost three tons – and considerable strength was demanded to run them out and to train them on target. 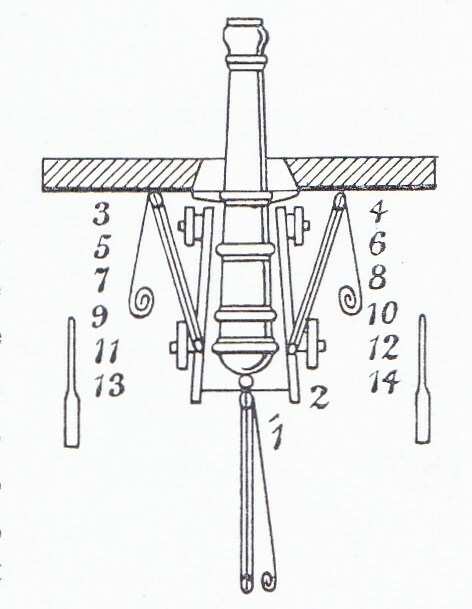 Elevation was controlled by a “quoin”, a graduated wedge placed under the rear of the barrel (see illustration) and if all guns on a broadside were to be fired together at the same target the amount of elevation, as per marks on the quoin, was ordered for all guns by the officer in charge. In training the gun to left or right to lay on the target “handspikes” – wooden crowbars – were used to lever the entire carriage across, aided by hauling on rope “side-tackles” which linked the carriage to the ship’s side. The illustration below shows this, and also the crew positions, as will later be discussed further. There was no way of controlling the recoil other than by a heavy rope – called the “breeching” – which passed through an eye on the breech of the gun and the ends of which were secured to ringbolts on the ship’s side. Then the gun fired it recoiled back the full length of the breeching. This brought the weapon into the loading position, with the muzzle just inside the gun-port and was restrained against running back out with the ship’s roll, by another tackle at the rear. These six men were called the “Gun Numbers” and the numbers above them were called the auxiliaries, Nos. 7, 9, 11 and 13 on the right and Nos. 8, 10, 12 and 14 on the right. Numbers 9 and 10 were the handspike men and Nos. 11,12,13 and 14 hauled on the side tackles to assist them. It can be seen from the diagram, and from the photographs of Victory’s middle gun-deck, that this large crew had to operate within a very confined space. The physical labour required was immense. If a high rate of fire was to be maintained then all fourteen men needed to function as a single well-rehearsed team and to do so, amid the choking and eye-stinging smoke and despite crashing noise that made verbal commands inaudible. Add to this the fact that the ship might be under fire itself and that great rents might be torn in the walls to either side by enemy shot, and that guns to right and left might have been dismounted and their crews killed or wounded. The size of the gun-crew meant that even with members knocked out of action sufficient men remained to maintain fire, albeit at a lower rate. The Gun Captain was responsible for his gun’s maintenance and for command of his gun-crew in action, during which he supervised laying, training and firing. 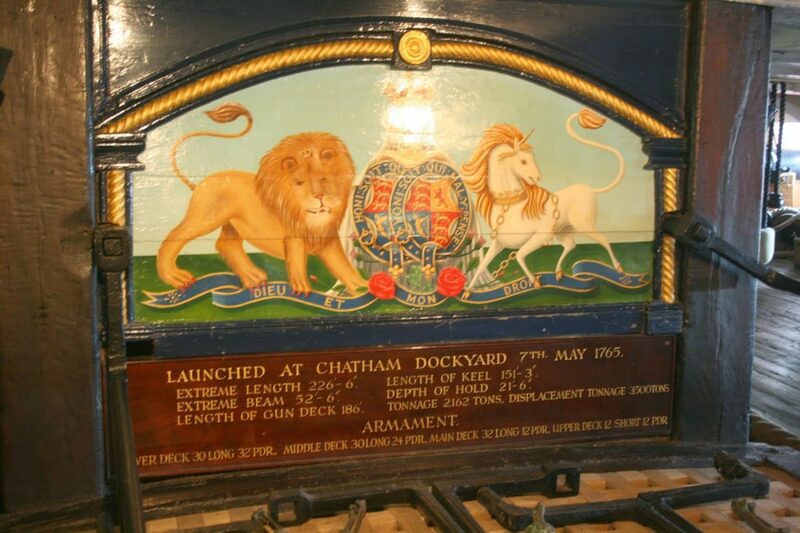 After each round was fired No.4 sponged the gun with a wet fleece to ensure that any residual and glowing particles of gunpowder had been left by the previous discharge. The cartridge and shot were then inserted by No.3 – manhandling one 32-pound shot after another demanded considerable strength and stamina. No.4 now inserted a wad to prevent the ball rolling out and he rammed them home. During these operations Nos. 5 and 6 provided support by passing ammunition and tools. The Second Captain was responsible for supervising elevation, via the quoin, for inserting the firing tube – which carried the ignition charge from the firing lock – and for cocking the lock itself, which was essentially a pistol, to be fired by the Gun Captain by jerking on a lanyard attached to the trigger. When laying the gun the Gun Captain retreated to the full extent of the trigger lanyard, bent over to get his eye lined up along the fore and back-sights, but positioning himself (“contorting” might be a better word) to spring safely on one side when the weapon was fired. 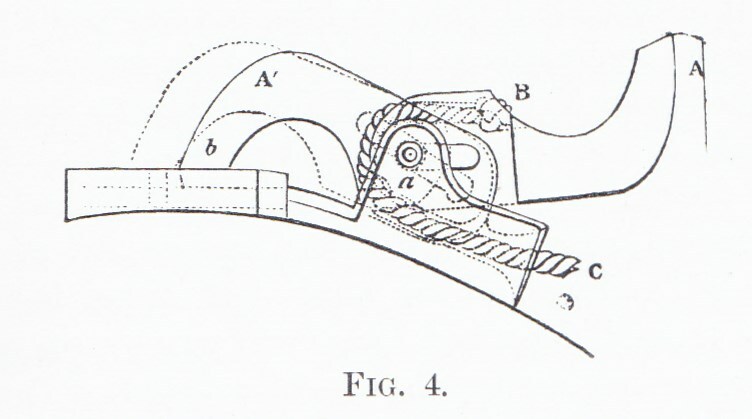 When training, the Gun Captain ordered “Muzzle Right” or “Muzzle Left” as appropriate to guide the handspike and side-tackle men until the aim was achieved. When laying for elevation he gave the handspike men the order “Elevate” and they levered beneath the breech , he giving hand-signals to raise or lower until he was satisfied. The Second Captain inserted the quoin and final adjustments up or down might then be needed until the exact elevation was set. 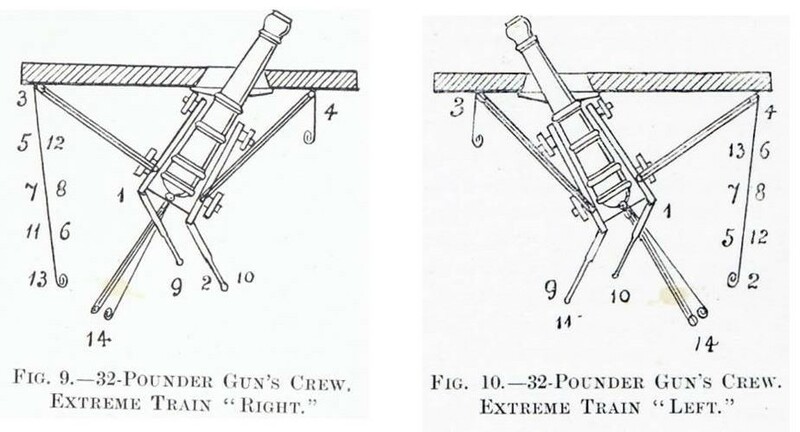 The procedure outlined above related to the gun firing more or less at right angles to the ship’s side but if it was necessary to train to extreme angles, as shown in the illustrations above, the crew positions would be changed accordingly. Managing this required an extreme degree of familiarity with the movements required if men were not to trip over and impede each other. Once again one is impressed with the degree of training and practice that must have been demanded. Two methods of firing were practised: “independent firing”, when each Gun Captain laid and fired his weapon independently and “broadside firing” in which all the guns were laid on the same target and fired simultaneously by order. In the Napoleonic period broadsides were fired by a “directing gun”, whose Gun Captain was regarded as the best marksman on board, and who gave the elevation and moment of discharge to all the others but the bearing was ordered from the upper deck. The description above related to a single gun. As a ship like Victory sailed into action fifteen such weapons lay close together along a single side, with comparable numbers of lighter guns on the two decks above. It is difficult to image just what a hell these gundecks must have been on close action – which sometimes lasted for hours on end – and that firing continued in a smothering haze when the decks around might be slippery with blood and strewn with body parts. It may have been the era of wooden ships, but it was also one of iron men. When and how did they use the fleece on a rope. The block on the opposite end is a rammer, correct?